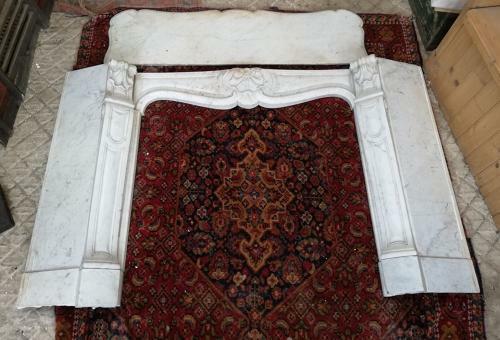 A beautiful, hand carved, carrara marble fire surround originating from France. The fire dates to the Victorian era, and is a copy of a Louis XVI style. The fire has decorative corbels and a pretty central design, featuring a shell and acanthus leaf design. The fire has a serpentine edged mantel and carved mouldings on each leg. The carrara has a lovely colour and attractive characteristics. The fire could be paired with a wood burner or fire basket. The fire is delicate and will need specialist transportation, please contact us if you require any advice. The fire will also need to be fitted by a fire fitter who will be aware of the technique for affixing to the wall. The fire has some metal plates that were used to line the fire opening when fitted previously and these can be supplied free of charge with the fire if required. The fire is antique and therefore has some signs of wear. The surround does need securing and some repairs. The left leg will need securing as some of the decorative pieces and base sections have become unstuck from the body of the leg. There are some small chips, scratches and marks, There are some darker stains to the marble on the crossbar and mantel. There is some slight residue on the sides of the legs where the fire has been previously fixed. The fire has a wonderful elegant look and is a very well made and quality item, ideal for adding character and charm to a home.